Looked at these at St Albans Poundland on Monday. They are on a stand alone carousel near the front next to mobile phone accessories. There were no obvious price tickets so I thought they were a quid! Metal construction not the later plastic stream lined ones. Perhaps a fiver is a bit much for the smaller sizes, I'm assuming they are priced per blade not a pair? Saw them in my local Aldi for £1.99 yesterday too. I picked some of these up for £1.99 in aldi last weekend. Store specific. £3.99 at mine. Only a few sizes left most places. 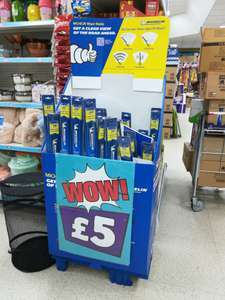 Saw the same display in Poundland, Cortonwood Barnsley, for £4.99 a pack. great price, but don't fit either of the cars in my house. Aldi were fine to refund. A low performance car with high performance tyres is nonsensical. Exactly, a good driver in a high performance car with rubbish tyres is safer than a crap driver in a low performance car. A driver loses control , not the tyres. A cause of an accident is never blamed on budget tyres, only on illegal tyres. If someone can't drive or doesn't drive carefully, an expensive tyre won't make a difference innit? Just saying. Looks like the MCH13 code has expired. Just had 2 fitted for £159 yesterday at Costco. Great tyre and great prices. I hope that’s the case for me too, did you do you’re alignment too? Costco Deal still wins, 320 for 4 tyres fully fitted. £159 for 2 fitted yesterday at Costco. Great tyre and great price. I think the offer ends Sunday though. (embarrassed) Unfortunately, the fat dude will go straight on at the first bend whenever it rains. Has anyone had cashback from Michelin yet? Just to round out this deal, I ordered and went to have the tyres fitted, at F1 Redditch. They fitted my two fronts, and allowed me to take 2 tyres away AND they said I can go back at the right time and have those fitted, covered by the original payment, they marked the receipt as such, so I think that is an even better deal than I expected, I wasn't counting on being able to go back a second visit included in the deal price. Had mine fitted today but in an 18”. The guys at F1 were absolutely fantastic and did a laser alignment check for free too. Very impressed they treated my nearly 20 year old Audi like a new car. As Michelin cashback should need to be confirmed within 5-day's and will get pay in 28-days. Is anyone's got Michelin cashback confirmed? Black circles doing 10% discount using code MICH10 if there isn’t an F1 centre near you. Costco are having Michelin Tyres on offer from 18/03/2019 till 31/03/2019. Just FYI: I went there the other day to get a quote, they said they will not replace runflat tyres with non-runflat tyres. Have a check of the prices on the 225/40/18 if they'll fit yer alloys Compared to the "correct" tyres: Speedo error 3.53% Old Tyres: Reading at 30mph 30mph New Tyres: 28.94mph Reading at 60mph Old Tyres 60mph New Tyres 57.88mph My "correct" size on the last car were 215/45/18 but 225/40/18 were notable cheaper. Quick check now... Tyreleader: 215/45/18 93Y XL 95.50 225/35/18 87Y XL 98.60 225/40/18 92Y XL 68.69 Never had a problem running the "incorrect" tyres on any of my cars tbh Just double check on www.willtheyfit.com prior to changing to make sure they're not whacking yer speedo out miles. To note the change I made above affected my speedo by 2.1%, so at 100mph I'd actually be doing 102.1Mph - neglible Reading at 30mph Old tyres: 30mph New Tyres: 30.64mph Reading at 60mph Old Tyres60mph New Tyres: 61.27mph Some may not need or want this but I've seen plenty cars running random as **** alloy/tyre combo's and I guarantee half of them don't even consider this. Nope, you are best to have your best tyres on the rear. Understeer is easier to control than oversteer. On a front wheel drive car you can get torque oversteer, where the front digs in and the rear drifts away. Excellent choice. I wanted some of these but when i got new alloys i needed 225/35/18s . They were ridiculously expensive. I was recommended Achilles sport ATR 2s by someone in the motor trade who got me a deal for £200 for all 4 corners. Good tyres but not for the rain, especially at 8,000 rpm. Even as a weekend car I miss my Rainsports 3's, they just do their job. I find for my car (205 55 16) that Michelin tyres are about 10% more than continentals and about 25% more than Hankook (ventus prime 3 is reportedly very good). I've also had the premium version for donkeys years after a great price in halfords many moons ago...the auto version with none removable gauge though so can only assume the internals are the same?? Bought one 5 yrs ago and used it 4/5 times a year. Super bit of kit and way better than the ring one I had before. Much quicker and sturdier. Highly recommended. Anybody claimed? The link to the claim site is dead and I'm bugged if I can find another way to claim. I never said I was buying new tyres lol, they still have plenty of tread. Goodyear eagle f1’s I buy most times, cracking tyres and price without these deals. Shame I can’t get 275 30 r21 in them they stop at 20 inch. Thanks for checking and letting us know. I have just rang the number on the page. ATS are not included in this promotion. Unfortunately, the world is not full of experts like you to know everything. Last time I ordered windscreen wipers for my Audi I got both as a set and fitted them myself... and thought it would be the same. btw, I did not force Aldi to move them to the back of the store. It was Aldi's manager who agreed and apologised that it was not clearly marked as single blade anywhere on the individual package or on the box, hence he moved it himself to avoid any confusion for others. So, kindly stop worrying about Aldi's sales. 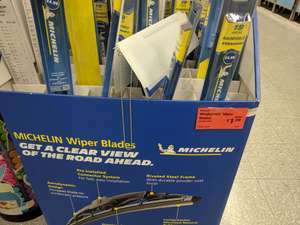 Stop being silly with your accident scenario due to wiper blades. I do a lot of DIY stuff and I would not try to do something myself if I don't know what I am doing, and would rather get them fitted at Halfords etc. Thank you..!! It clearly says the size on the packaging. If you took 2 seconds to visually look at your windscreen you would see your auris has one large drivers side wiper (about 26") and one much smaller passenger side wiper (about 16") which almost touches the edge of the passenger side screen. Why in the world would you think two 26" wipers would fit? 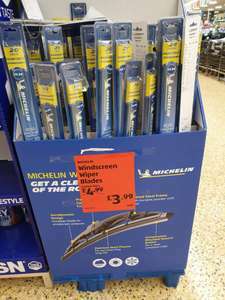 I feel sorry for that Aldi store who are probably losing sales now because the wipers are at the back of the store due to your stupidity. Seriously if folks don't have a clue about things like that for their cars then leave it to a professional who does know. A badly fitted wiper will come off when being used, ie in the rain &amp; poor visibility which will most likely cause an accident putting yourself &amp; others at risk. In there today. Can confirm they still don't do "X.99p". Yes, they had them for £5. Total £329.10 Thanks for heads up! Even cheaper now by using MICH10 code. £333.34 for 4 225/40/R18 including delivery! city roads, a roads, they're all crap. Same prices as other companies but charge £11 for delivery. A no from me. Odd, so far they're reliable for us. Fantastic tyres, yeah they are good if it snows but it's how they perform in the everyday wet that's sold me. Really good tyres for all season UK weather. Well, you know, my summer tyres have been doing just fine this February so far. Ah ok, fair enough. I dont see the point of them. Tyres are seldom the root cause of an accident. They should cost a pound not a fiver, shouldn't they? Completely agree! Was not impressed with them.